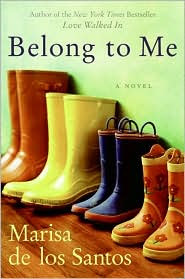 Belong to Me, is utterly magical. You’ll meet the best 14 year olds, ever. The men of this novel are varied and “keepers”, in the relationship derby. But, it’s the women of this story you’ll fall the hardest for. The story is told from the perspective of 3 different characters, two of the women and one of the teenagers. De los Santos braided their tales together, to tell a beautiful tale that had me twisting and turning in all directions, laughing out loud or crying, while cheering their relationships on. The struggle through heartbreak and the will to find love and happiness is what it’s all about. This is de los Santos' second novel, and a follow-up to the first one, Love Walked In. It is not necessary to read Love Walked In, before Belong to Me. Belong to Me really does stand on it's own two feet.